Throughout the history of modern music, some of the most talented artists haven’t enjoyed the commercial success and critical acclaim that their considerable talent deserves. That was the case with Nick Drake, Jackie Leven, Gram Parsons, Townes Van Zandt, Michael Chapman, Tim Buckley, Alice Clark, Linda Perhacs and Vashti Bunyan. None of these artists went on to enjoy fame or fortune. Far from it. The music of Jackie Leven and Townes Van Zandt was enjoyed by a small, but discerning coterie of music lovers until their death. Meanwhile, Michael Chapman continues to tour, but still, his albums fail to find the audience that they so richly deserve. Sadly, this is all too familiar a story. It was also the case with Alice Clark, Linda Perhacs and Vashti Bunyan’s debut albums. Sadly, each of these albums failed commercially. This resulted in these three talented singers turning their back on music. Music was loser. Music was also the loser when Nick Drake, Tim Buckley and Gram Parson’s careers were cut tragically short. Each of these artists joined the dreaded twenty-seven club. Ironically, the music of Nick Drake, Tim Buckley and Gram Parson would belatedly find the audience it deserved. That was also the case with Jackie Leven, Townes Van Zandt, Alice Clark, Linda Perhacs and Vashti Bunyan. Belatedly, these artists are reaching a much wider audience and receiving the critical acclaim it so richly deserves. It’s a similar story with Southern Soul singer, Rozetta Johnson. 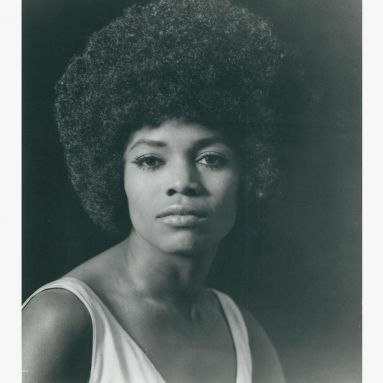 Recently, her career was documented on a new compilation, A Woman’s Way: The Complete Rozetta Johnson 1963-1975. It was released by Kent Soul, an imprint of Ace Records, and features twenty-two tracks. They’re a celebration of the life and music of Rozetta Johnson. She was born in Tuscaloosa, Alabama on the 11th of June 1942. From an early age, Rozetta Johnson loved music. She also loved to sing. This she did at the local church, and at home. That was until she said her prayers. Rozetta Johnson’s family were church going, and God-fearing people. The rule in the Johnson house was that once Rozetta had said her prayers, there was to be no singing. This rule young Rozetta obeyed…usually. Then one night, when Rozetta Johnson was about six, she went to her room and said her prayers. Later, when she was listening to the radio, her favourite song, Goodnight Sweetheart, came on the radio. Rozetta began to sing along. Her great-grandfather told her to stop singing. Young Rozetta began to hum along to the song. This her great-grandfather took as an act of disobedience. He left the room, and returned with his switch. For this perceived act of disobedience he beat young Rozetta. That night, she cried herself to sleep. For a while, Rozetta was too scared to sing. Her career was nearly over before it began. Thankfully, that wasn’t the case. Growing up, Rozetta Johnson sang in church, and later joined a gospel group. Each Sunday, they would sing in several churches. As the group’s popularity grew, they were singing in five different churches. Still, though Rozetta chose to stay in the background. The beating she had suffered weighed heavily on her mind. Then one Sunday, Rozetta had no option but to move to the front of the gospel group. The two lead singers had an argument, and decided that they couldn’t or wouldn’t perform. Rozetta Johnson stepped into the breach. That day she regained her confidence, are musical career began to blossom. Especially when the gospel group broke up. While this was a disappointment, it allowed Rozetta Johnson to think about the future. By then, she was seventeen and hadn’t earned a thin dime singing gospel all these years. Up until then, Rozetta was happy just to be singing. However, deep down, Rozetta knew she could make a living as a singer. So she decided to head to the local club she passed each day, the 401 in Birmingham, Alabama. That was where Rozetta Johnson lived with her grandmother. She though Rozetta was in church, as she headed to the 401. With more than a degree of trepidation, Rozetta took her first tentative steps into the 401. This was unknown territory for her, and for the family, the 401 would be the equivalent of Sodom and Gomorrah. Never having set foot inside a nightclub, Rozetta was totally unprepared. Especially when the owner asked her to audition. Rozetta Johnson sung the only secular song she knew, Somewhere Over The Rainbow. When she was asked what key she was about to sing in Rozetta had no idea. Despite being so unprepared, Rozetta received a standing ovation. The next day, Rozetta was hired and from the following Sunday, she would receive $8 each night. For a high school senior, this was a small fortune. More importantly, Rozetta Johnson was taking her first tentative steps in a career as a professional singer. Over the next few years, Rozetta served her professional apprenticeship. She honed her style singing sets that featured songs Rozetta heard on the radio. They were reworked by Rozetta. However, after three years singing professionally, she got her big break. This came when Rozetta Johnson was spotted by Bill Doggett. He was looking for a female vocalist for the Bill Doggett Revue to cover maternity leave. Rozetta fitted the bill. Her brief spell with the Bill Doggett Revue was the next part of her musical apprenticeship. This was good experience. Working with such seasoned performers helped Rozetta to improve her stagecraft, and prepared her for when she made her recording debut. 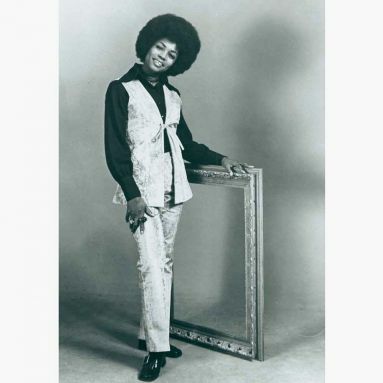 It’s the first of the songs that feature on A Woman’s Way: The Complete Rozetta Johnson 1963-1975. 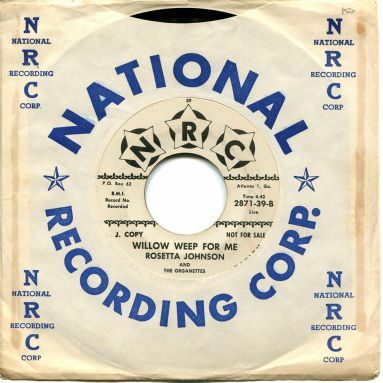 By 1963, Rozetta Johnston was signed to Bill Lowery’s NRC label and about to make her recording debut. It wasn’t a solo single though. Instead, Rozetta as accompanied by The Organettes. They were backing vocalists that Rozetta met at the recording session. They only recorded the one single, I Understand My Man, with Willow Weep For Me on the B-Side. 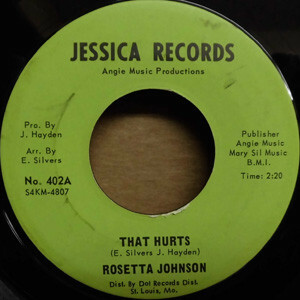 When it was released in 1963, Rozetta Johnson was billed as Rosetta Johnson and The Organettes. The single failed to make any headway, and Rosetta Johnson and The Organettes’ recording career was over before it had even began. For Rozetta Johnston the whole experience had been disappointing. That Hurts, a soul-baring ballad. On the B-Side, was It’s Nice To Know You. When That Hurts was released later in 1965, it failed to make any impression. History was repeating itself all over again. Or so it seemed. That was until Atlantic Records decided to take a chance on That Hurts. They licensed the song from Jessica Records, and it was released in July 1966. Despite Atlantic Records’ financial power and marketing expertise, That Hurts failed to trouble the charts. It seemed that Rozetta Johnston’s recording career had stalled. For the next four years, Rozetta Johnston found herself singing mostly, in local clubs. Very occasionally, Rozetta headed out of Alabama, and sung in another state. Most of the time, she found herself singing in the same local clubs. It must have been a frustrating time. Especially with her recording career having stalled. However, as the sixties gave way to the seventies, Rozetta ’s luck changed. 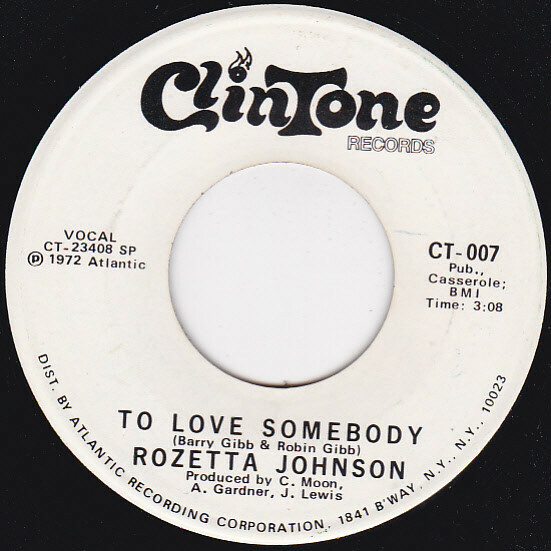 In 1970, Rozetta Johnston’s recording career resumed when she signed to Clintone Records. They had recently signed a distribution deal with Atlantic Records. This meant there was more chance that Rozetta’s singles would find an audience nationwide. Especially if they were written by Sam Dees. Rozetta Johnston met Sam Dees through her manager Jesse Davis. Sam was writing and producing for Clintone Records. That’s despite Sam Dees being a talented singer in his own right. Sadly, Sam Dees struggled to make a breakthrough. That would be the case throughout his career. However, Sam Dees was a talented and prolific songwriter, and would pen Rozetta Johnston’s Clintone Records’ debut. Sam Dees penned A Woman’s Way under his Lillian Dees alias. He also wrote the B-Side Mine Was Real. Both sides were arranged by Dale Warren and produced by Sam Dees and Clinton Moon. They pull out all the stops, using strings, horns and harmonies to accompany Rozetta, as her vocal veers between tender to powerful and later, becomes a soliloquy. This would prove to be a masterstroke. When A Woman’s Way was then released in October 1970, it reached ninety-four in the US Billboard 100 and thirty-nine in the US R&B charts. This was regarded as a success as Clintone Records was a relatively new label, and A Woman’s Way was Rozetta Johnston’s first single in four years. Belatedly, she was enjoying a tantalising taste of the heady brew that’s success. After the success of A Woman’s Way, Clintone Records were keen to build on the momentum that had been created. 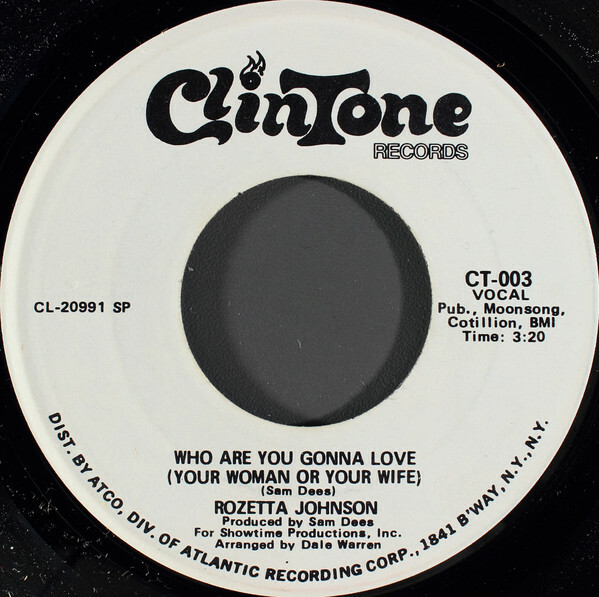 So Rozetta Johnson was sent back into the single to record two more songs that had been penned by Sam Dees, Who Are You Gonna Love (Your Woman Or Your Wife) and Can Feel My Love Comin’ Down. 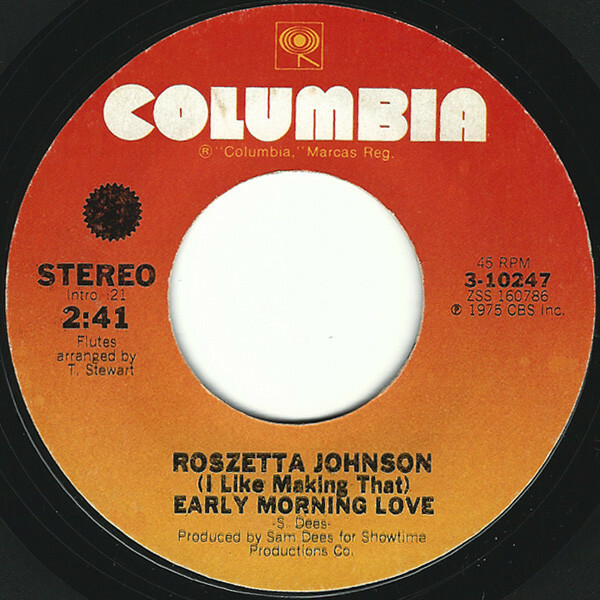 The version of Can Feel My Love Comin’ Down on A Woman’s Way: The Complete Rozetta Johnson 1963-1975 is an alternate take that was recorded at the same session. These songs were arranged by Dale Warren and produced by Sam Dees. Once they were recorded, the single was scheduled for release in early 1971. In February 1971, the string drenched ballad Who Are You Gonna Love (Your Woman Or Your Wife) was released as a single. Despite the quality of this future soul classic, it stalled at just forty-five on the US R&B charts. Although this was disappointing, Rozetta Johnson had just enjoyed another hit single. She was two for two. The problem was, the two hit singles were only minor hits. Given their quality, they deserved to find a wider audience. It was a case of back to the drawing board. Just like Rozetta Johnson’s two previous singles, Sam Dees wrote her thing single Holding The Losing Hand. This was another ballad, and one that seemed tailor made for Rozetta. She combined power and emotion, while gospel tinged backing vocals and string accompanied her. On the B-Side was an uptempo stomper Chained and Bound, where Rozetta delivers a vocal powerhouse. With Sam Dees taking care of production, surely Holding The Losing Hand would mark a change in fortune for Rozetta? On Holding The Losing Hand’s release in September 1971, it failed to even trouble the lower reaches of the charts. 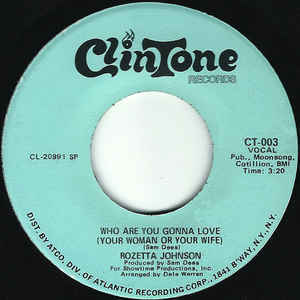 This was the first single Rozetta Johnston released for Clintone that hadn’t charted. This was a huge disappointment. 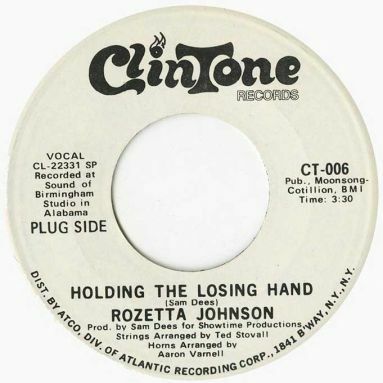 After the failure of Holding The Losing Hand, five months passed before Rozetta Johnston returned with her fourth single. This time, there was no sign of Sam Dees. He was working on a new album for Atlantic Records, The Show Must Go On. With Clintone Records’ main source of songs unavailable, Rozetta covered Barry and Robin Gibb’s To Love Somebody for her next single. For the B-Side, Belford Hendricks and Clyde Otis’ Can’t You Just See Me was chosen. They were produced by the Moon, Gardner and Lewis production team and were due to be released in early 1972. Despite reinventing To Love Somebody as a soul-baring Southern Soul ballad, the single failed to chart upon its release in February 1972. This was another blow for Rozetta Johnston. Her last two singles hadn’t come close to troubling the charts. It was a worrying time for Rozetta Johnston. Later in 1972, Rozetta Johnston returned to the studio to record the Sam Dees and David Camon penned ballad How Can You Love Something You Never Had. With song recorded Personal Woman was chosen as the B-Side. This uptempo dancer seemed a good choice at the time. Later, Rozetta later cast doubt upon whether the recording is actually her? It’s hard to tell. She was a versatile vocalist who seamlessly could switch between styles. Indeed, Rozetta could mimic a wide variety of singers, so there is every chance she features on Personal Dancer. It features on A Woman’s Way: The Complete Rozetta Johnson 1963-1975, allowing the listener to decide. However, later in 1972, when How Can You Love Something You Never Had was released the single failed commercially. Time was running out for Rozetta at Clintone Records. Little did Rozetta Johnson realise, that she would only record one more single for Clintone Records. This was It’s Been So Nice, a slice of the deepest soul. On the B-Side was the hook-laden dancer (I Like Making That) Early Morning Love. Both sides were penned and produced by Sam Dees, who had played such an important part in Rozetta’s career. However, the single wasn’t released until 1975. Initially, It’s Been So Nice was released on Clintone Records in 1975. Rozetta watched as the single failed to chart. She felt that Clintone Records hadn’t promoted the single sufficiently. It was a similar case when It’s Been So Nice was picked up by Columbia later in 1975. Again, it failed to even trouble the charts. By then, Rozetta was totally disillusioned with the music industry. That was why Rozetta Johnston made the decision to turn her back on music. That was no surprise. Rozetta has released a string of singles that oozed quality. Especially the ballads. They featured Rozetta Johnston at her very best as she breathed life, meaning and emotion into the songs. However, when they were released as singles, they failed to find an audience. Maybe it would’ve been different if they had been released on a major label? Then Rozetta Johnston’s music might have found the audience it deserved. However, in 1975, that wasn’t the case. Rozetta Johnston was struggling to make a living out of music. She was no longer getting the bookings she once had. To make matters worse, only two of her singles had charted. Even then, they were only minor hits. So Rozetta Johnston made the decision to embark upon a new career. This meant going back to school, and then heading to college part-time. Rozetta Johnston worked her way through college, and eventually, graduated with a BA in sociology from the University of Alabama. After graduating, Rozetta Johnston began work as a teacher at Ramsay High School. Little did the pupils know that their teacher had once been one of the best up-and-coming Southern Soul singers. Rozetta Johnston could’ve and should’ve become one of the most successful Southern Soul singers. Sadly, that never happened. It was only later that the music Rozetta Johnston released between 1963 and 1975 has began to find a wider audience. 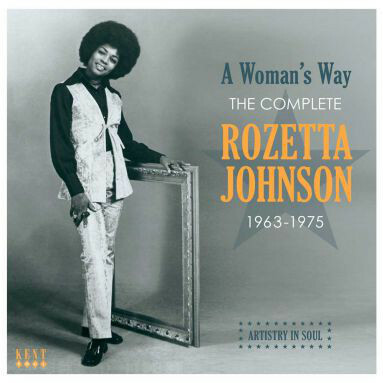 It’s featured on a new compilation, A Woman’s Way: The Complete Rozetta Johnson 1963-1975. It was released by Kent Soul, an imprint of Ace Records, and features twenty-two tracks. This includes previously released alternate takes of I’ve Come Too Far With You (To Turn Back Now) Mama Was A Bad Seed, You Better Keep What You Got and I Can Feel My Love Comin’ Down. There’s also a version of For That Man Of Mine, which was first released on CD in 2007. By then, Rozetta Johnson had made a comeback. She had reinvented herself as a jazz singer, before returning to her first musical love, gospel. Sadly, three years after releasing a gospel album in 2008, Rozetta Johnson passed away on the 24th March 2011. Her music is remembered on A Woman’s Way: The Complete Rozetta Johnson 1963-1975, which is a celebration of the life and music of one of the finest Southern Soul singers of her generation, Rozetta Johnson. ← I’M NOT TALKIN’-THE SONG STYLINGS OF MOSE ALLISON 1957-1971.